For the first time in years I did not make a spring pilgrimage to New York City. In years past I would spend a few days in the Big Apple in the spring to catch a few new shows, do some shopping and just take in the joys of the city in the spring. I did not make it this year, but alas, I have made a few notes for what I want to do on my next trip to New York. If I am fortunate, I will be able to catch a cabaret performance of the legendary jazz piano performer Barbara Carroll. I love cabaret shows, and New York is the place to go to catch a glimpse of legendary artists like Miss Carroll, who has been performing for well over 50 years. 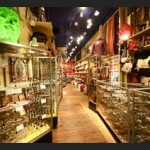 On the shopping side, I want to make sure I see out Beads of Paradise on my next visit to New York. Bead of Paradise looks like just about the coolest shop around – a place where you can buy new and vintage jewelry and beads. From what I can see, a visit to Beads of Paradise is an assault on the senses and just about the best idea for a store I have heard in LONG time. Read more about Barbara Carroll here. See more about Beads of Paradise here. Lost Cowboy is powered by	WordPress 5.0.4 and delivered to you in 0.788 seconds using 45 queries.